If you are looking for custom t-shirts in Florida, then you have come to the right place because Tip Tops is your one stop shop for all your t-shirt needs. 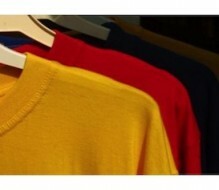 While you know there are different styles of t-shirts such as crew neck, v-neck, sleeveless, or shirts with sleeves, did you know that there are different types of t-shirts you can choose from? Carded cotton is the most inexpensive t-shirt that we offer because it is made from open cotton with ounce weights of 5.5 up to 6.1 ounces. You can hold up one of these basic shirts to the light and see through it, especially on 5.5-ounce weight fabrics. When the product description says’ “100% Cotton” and nothing else, it’s always open cotton. Our ring-spun cotton is stronger and softer both inside and out. Since the cotton is spun the fibers are more dense, softer, straighter, stronger and more durable. Our combed ring-spun cotton is very high quality because the cotton is spun and then combed. Fine brushes are used to pull out any impurities, along with short fibers leaving behind only long fibers, which are straight, even and aligned. The texture of combed cotton is very soft and very smooth since it lacks short threads all dirt and impurities have been removed. Tip Top’s Egyptian Combed and Interlock Ring-Spun Cotton is the highest quality. Egyptian Cotton is considered the finest and highest quality cotton in the world. When you are looking for Screen Printing in Florida then give us a call at Tip Tops and we’ll help you with all of your custom designed t-shirt needs.